This interview was conducted via email by Interview Editor Monica Petersen. She said of the process, “Prepping for the interview was such an exciting experience because I knew I was going to have a conversation with the author of the New York Times Bestseller I was currently reading and enjoying. Lauren’s books are thoroughly entertaining and possess inspiring, emotional honesty.” She discusses writing a love story to her hometown, fairy tales, and the art of storytelling in this interview. Superstition Review: What inspired you to write a love story to your hometown of Cooperstown, New York? How did The Monsters of Templeton accomplish that goal for you? 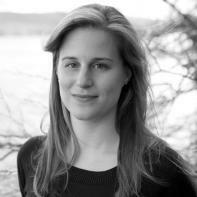 Lauren Groff: By the time I started Monsters, I’d discovered (through my own abject failure at writing a few novels) that the most important element of writing is the selection of the subject matter. I’d failed three times before my first published book to find a topic that was dear enough to me that I would do the work and spend the time that’s necessary to get to the end of a final draft. I was living in California, in a sad job, with no real friends around me, and was so lonely that all I wanted to do was spend all day in Cooperstown, a place I love deeply. And the book was born out of homesickness and a desire to create a loving, warm world around me. SR: James Fenimore Cooper sets The Pioneers in a fictionalized town called Templeton, which is modeled after Cooperstown. How did you build on or reimagine Cooper’s Templeton to create your Templeton? LG: Cooper’s Templeton is my Templeton: his is just set a few centuries earlier than mine. I loved how playfully he fictionalized our mutual hometown, how he turned his own father, William Cooper, into Marmaduke Temple, and in the process bowdlerized some unsavory aspects of his father’s personality. I thought it was a poignant reflection on both the creation of self and literary creation, and I filched his idea and applied it to my own book. SR: In The Monsters of Templeton, a lake monster named Glimmey surfaces when Willie arrives. What is the relationship between the surfacing and the arrival? LG: I could tell you, but that would take all the fun out of your sussing it out for yourself. As soon as you read the book, it became yours—it’s no longer mine—and your interpretation is more valid than mine is. SR: Many of your short stories have been published outside of Delicate Edible Birds including The Atlantic, Ploughshares, and The New Yorker. What approach do you take when deciding which stories to collect for a book? Do you write stories specifically for the collection? LG: I’d been working on some of the stories in DEB for twelve years before the book came out. By this, I mean that I’d tried to tell them for twelve years and only found the right way to go about doing it a few years or months before the book was published. I never wrote stories specifically for the collection, but did tweak some previously unpublished ones so that they fit better into the whole. I think when you watch an individual write over a series of years, you come to see that they’re writing about the same set of obsessions over and over until they finally exorcise the obsessions and can move on. I tried to make the book cohesive in somewhat more subtle thematic ways than were apparent in Monsters, carrying the ideas of water, of birds, of brittle, powerful women from story to story. SR: I noticed that in several of your stories characters go unnamed, like the narrators of “Majorette” and “Sir Fleeting.” Why do you choose to have unnamed narrators in particular stories? LG: I suppose it’s the influence of fairy tales, which recurs in all my work. Sometimes you need a character to be unnamed so that the character seems both universal and particular at the same time: you sometimes want to play with that tension. SR: Your story, “Lucky Chow Fun,” reintroduces readers to Templeton from your debut novel. Did this story come before or after the success of The Monsters of Templeton? What was your approach to creating a new atmosphere in Templeton after Monsters? LG: That story was odd. I wrote it at the same time that I was writing Monsters, mostly because I wanted to test out the idea of writing about a shadow-Cooperstown called Templeton. Also, however, because I limited the front-story, the contemporary story, to Willie Upton’s point-of-view, and it burned in me that because of this limited viewpoint I wasn’t able to write about things that were outside of Willie’s experience. The story was published in Ploughshares before the book came out, which delighted me, because it augured a good reception for the book, thank goodness. SR: One of my favorite quotes in Monsters is “Amazing thing, fiction. Tells you more, sometimes, about the writer than the writer can tell you about himself in any memoir.” Is this true in your own writing? Is there any time you have tried to tell your readers something about yourself indirectly in your fiction? If so, how? LG: Oh, dear, no: I was playing a little game, there. I knew the reader would be tempted to see me in Willie, because we’re from the same place, and so I put that line in as a kind of tweaking. Every book I’ve written so far has been deeply personal, and hardly at all autobiographical. The most autobiographical thing I’ve ever written was “Lucky Chow Fun,” and nothing that happened in that story ever happened to me, except for the fact that my little sister was an ornithological wunderkind and I was a very good high school swimmer, and my dad did wander away in Harrod’s and hours later, after we found him, blamed us for it. Everything else was made up. SR: The art of swimming is a common link in Monsters of Templeton, “Lucky Chow Fun,” and “L. DeBard and Aliette.” What is so significant about swimming in these particular stories and how does it connect these stories together? LG: Swimming and writing seem to me to be startling echoes of one another. You are solitary in both, even if the pool is full of swimmers and your book is published and read. You are never good at first; you have to learn what you’re doing. You have to push through the pain to get to a point of transcendence; and through the long, daily slog to get to the race. And when you get to the point where you’re floating, it’s utterly gorgeous, a thrilling brief taste of freedom. And water is a literal and figurative undercurrent in every story in that book. SR: Your new novel, Arcadia, focuses on how Bit ages as the commune develops and collapses. How was writing this novel different from Monsters, where you focused on the progression of a town and not one person? LG: I spend a year researching my books before I start them, and they slowly take shape over the course of the year. With Monsters I had to write four completely different drafts—with different techniques, different modes of storytelling—before jettisoning the drafts and starting anew. But with Arcadia, I knew, pretty much from the beginning, what the overall arc of the story was going to be (paradise lost, semi-regained), and so I had the architecture of the book in my head before I began. The trouble was balancing everything in storytelling, which was breathtakingly difficult in that book. SR: Describe your approach in creating the commune where Bit grows up in Arcadia. Did you model it after any particular commune or society? LG: I modeled the intentional community of Arcadia after multiple philosophical or real-life utopias, but most notably two: Oneida, a 19th century commune in upstate New York, and The Farm, a late-1960s through 1980s (in its heyday) commune in Tennessee. This book wouldn’t exist without my visits to either place. I’m so grateful to both. SR: In Arcadia, Bit treasures the book of Grimm’s fairy tales that he finds. How did you decide to include fairy tales in this novel that takes place in a culture removed from society? SR: How does Bit’s outsider status resonate with you as a writer? LG: Oh, god, I hope every writer thinks of herself as an outsider. You can’t write from inside. SR: In an interview with The Millions, you say that life tends to “happen in intense, emotionally-charged spurts, followed by long, fallow periods of relative calm.” Did this concept of time aid your creation of the episodic sections of Arcadia? If so, how? LG: The episodic sections were a result of my feeling that life happens mostly in the interstices—when we’re not paying attention. Only in retrospect can we find the shape of the story with which we make sense of things. I wanted to replicate the feeling of living in this book. SR: In “Watershed,” you write that “storytelling is simple: selecting a few strands from many and weaving them into cloth.” How is this idea reflected in Arcadia which connects four distinct episodes into the life of Bit? LG: That quote is an utter lie, but the main character of that story is distressed, so I’ll let it slide. The truth is that storytelling is horribly difficult, not simple at all. That said, it is true that storytelling is about selection—what details to include, what to elide—and the format of Arcadia relied heavily on selecting what to tell the reader about the story, what things were most important for the forward engine of the plot, what to leave silent, what to allow the reader to infer. SR: My favorite story in Delicate Edible Birds is “Watershed” because the tragic ending sharply contrasts the wistful beginning scene. In writing that story, did you know how it was going to end before you wrote it? Or was it something that evolved as you were writing? LG: Thanks. That was one of the strange gift stories that happen every five years or so—it was right before my wedding, and I corralled all of my anxiety about someday losing this person who was the most important person in the world to me into one long burst of a story. It came to me whole. That never happens. You weep a little with gratitude when it does. SR: What was your process for writing the historical parts of The Monsters of Templeton in a variety of styles including letters, diary entries, and personal narratives? LG: I had an astounding young-writer’s exuberance back then and just tried things until they worked. I wrote probably two thousand (longhand—I write all first drafts longhand) pages before settling into the story as it appeared in print. SR: Do you have a different mindset when you write a novel versus a short story? If so, what is the difference in your approach? LG: I wake up every day to a novel—it’s a slow, comfortable, loving thing, the one thing I know I’m going to do every day, and provides me with a measure of stability. You have to trust that one day that book is going to become something worthy of your time and carry it around with you for years. I write stories when the urgency of telling them becomes so powerful that I can’t see the novel in front of me. I try to write a first draft in a single sitting, and it’s usually a disaster, and then it takes a year or so of sporadic revision to get it into shape. SR: As a writer, do you have a particular goal that you intend to achieve when you sit down to write? LG: I want, so very, very badly to be able to put what I see in my mind on the page. I can never put what I see in my mind on the page. You just try to do what Beckett said and fail better every time. LG: It’s a dark, dank former toolroom in my unairconditioned Florida garage. Cement floors and a treadmill and a chaise longue infected with lizards. Too many old coffee mugs and a window that hasn’t been cleaned in five years and books that I’ve forgotten to bring back in the house because if you leave books out there for more than a week, they’ll be eaten by cockroaches (sorry: “palmetto bugs” in the Florida euphemism) or have in a fine black powder of mold on them. Stacks of pages in longhand, whatever I’m working on. My children’s artwork and a butterfly on the wall and a standing desk and a sit-down one, too. A strange half-swampy smell from the neighbor’s compost heap by the window. Heaven.